For decades, the American prison system has grown in size and shape. 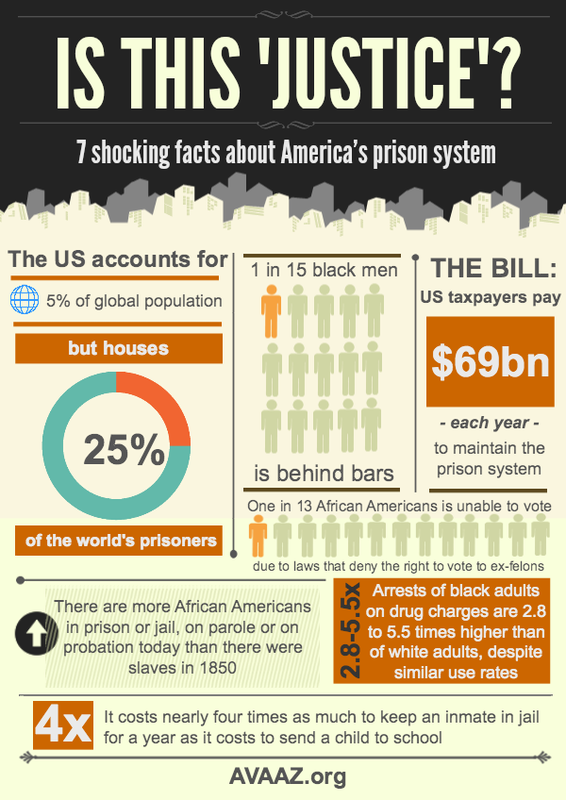 According to the ACLU, the U.S. represents 5 percent of the world’s population, but holds claim to 25 percent of the world’s prison population.1 out of 99 adults are living behind bars, and 1 out of 15 African-Americans are imprisoned. Further, 1 out of 13 African-Americans cannot legally vote because of laws which deny ex-felons the right to vote. The obvious ethnic disparities in the prison population highlights the injustice found within the U.S. system, and how little we have looked to address the socioeconomic disparities and racially-biased laws which lead to the mass incarceration of minorities. Statistics on the ethnic disparities within the system make a strong point. However, it’s also worth investigating the beneficiaries of the U.S. prison system to understand why there are more African-Americans in prison or on probation than there were slaves in 1850. U.S. taxpayers pay $69 billion every year to maintain prisons. Rather than constructing ways to reform the justice system, the government decided to outsource prisons to private companies. For-profit prisons help explain the 700% increase in prison population since 1970. An ACLU report found that the top two private prison companies received around $3 billion in revenue, and that nearly half of the detained immigrants in the U.S. are in private prisons. The morality and legitimacy of private prisons comes into serious question as they lobby to manipulate the criminal justice system into a system of profiteering. The already established ethnic inequalities within the U.S. need to be addressed and fixed. Unfortunately, the incorporation of private companies into the justice system has since furthered a system of repression of immigrants and minorities.